Juri Troy’s office was founded in 2003 and looks out into the world from Vienna and Vorarlberg with never forgetting its roots. Their projects concentrate on the topics sustainability, energy efficiency and holistic building concepts. Therefore the use of the material wood plays always an important role in their work. The main focus is a sustainable and holistic approach to architecture where the results are often sculptural structures and differentiated spatial sequences that distinguish themselves through their contextuality as well as their materials and their energy concepts. In 2010 Juri Troy realised the first completely carbon neutral house in Austria, that was awarded with many national and international prizes. In 2012 he was awarded under Europe’s most emerging young architects – 40 under 40. Since 2006 he holds a lectureship at the Technical University of Vienna in the Departments for Architecture and Design as well as Spatial and Sustainable Design and at the University of Applied Sciences of Vienna – Department for Green Building. A simple wooden house HOUSE H2 was set on a massive pedestal in the hillside. The orientation of the two-story loggia follows the client’s favourite view over the Wienerwald valley. The entire timber structure consists of prefabricated CLT-elements with a silver fir finish. 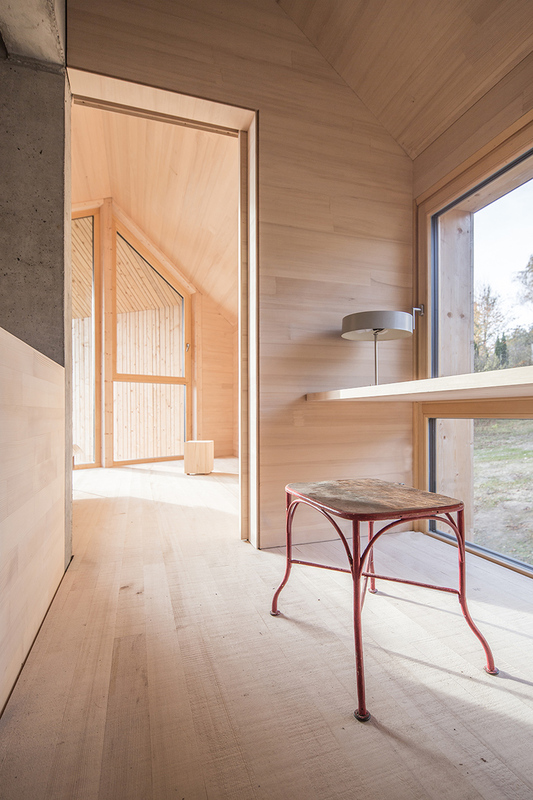 Wood wool was used for insulation and the façade was made of rough spruce planks. From the beginning, the focus was on an overall concept that was limited to the essentials. The building concept is designed to the “Niedrigenergiehaus” standard and uses only wood and green electricity as an energy source. The house is currently a second home but in a long term it could became a center of life completely in the country. The existing “STRECKHOF” of the family should be extended by a residential house which is located between the still intact structures of the neighbouring barns and uses the same materials: wood and brick. Booth gable walls are made of 50cm burned vertical coring brick plastered with uncoloured lime-cement outside and clay-lime inside. The entire upper floor and attic, as well as the folding shutters are made of domestic silver fir. The floor on the ground floor was created using the old technique of clay-casein coating. Handmade tiles and insulating materials made from renewable raw materials complete the material concept, which is based on natural building materials. In the existing Barn next to it, the owner’s distillery was installed as a restrained, dark coloured spruce box.